What would New Year's Eve be like without Prince Orlofsky's party in Die Fledermaus? Allow me to quote from the great Victor Borge's My Favourite Intervals. As the curtain goes up, we see an empty room in the Eisenstein house. This is a crucial moment in the operetta, because it's the last time anybody knows for sure what's going on. After that, the plot is one mass of confusion, with mistaken identities, people making love to their own wives, and other absurdities. In many productions on Die Fledermaus, performers wander in from other operas and sing music by other composers and by the time the chorus gets to the big number at the end of Act Two, the singers are so befuddled that they gurgle things like "hu hu hu hu" and "dui-du, dui-du, la la la, la la la". The setting of Die Fledermaus is "a watering place near a large town" but since nobody gets to see either the town or water, you might as well forget about that part of it. The main characters are Gabriel von Eisenstein, when he isn't pretending to be the Marquis Renard; Rosalinde, his wife, when she isn't pretending to be a Hungarian Countess; Adele, her chambermaid, when she isn't pretending to be Olga the Actress; Frank, the jailor, when he isn't pretending to be the Chevalier Chargrin; and Alfred, the singing teacher, when he isn't pretending to be Gabriel von Eisenstein. The only person who isn't pretending to be anybody else is Prince Orlofsky, and he's always played by a woman. Nor does it take place on New Year's Eve but somehow or other it has become associated with those particular festivities. Here is Doris Soffel as Prince Orlofsky, singing Chacun á son gout in the 1984 Covent Garden production of the opera. Hermann Prey was Eisenstein (at this stage the Marquis) and Kiri Te Kanawa made a glorious Rosalinde. Extra treat: here is Dame Kiri from the same production, singing a Hungarain czardas to prove that she really is a Hungarian countess. With the traditional staple of conservative Christmas greetings: Dingley Dell. Today is the anniversary of the Tamworth Manifesto, issued by Sir Robert Peel on December 18, 1834. It remains one of the most important documents in the history of the Conservative Party. Historical fiction was the introduction to history for me as it must have been for many people. Somehow, as time went on and I read more history and biography I began to find the fictional version less interesting. I still reach for Georgette Heyer's Regency romances if I want a pleasant comfortable afternoon and there are one or two (not many more) historical detective story writers whose work I enjoy but I doubt whether I would get quite as involved with The Three Musketeers as I did at the age of 10. The real story behind the siege of La Rochelle, on the other hand, is fascinating. Still, one must applaud historical fiction and its continuing popularity, not to mention the fact that through Hilary Mantel's work it has acquired a literary status it did not possess before. An admission: have not yet read Ms Mantel's books about Thomas Cromwell. History Today has a list of historical novels published in 2012, starting with Bring Up The Bodies and ending .... well, with a slightly unexpected choice. Do read the short article. For the man, woman and child who has everything, there are wonderful presents (TH is not given to advertising usually) to be had from the Conservative Party Archives. Yesterday was the anniversary of the Statute of Westminster 1931, which "established legislative equality for the self-governing Dominions of the British Empire with the United Kingdom, thereby marking the effective legislative independence of these countries, either immediately or upon ratification". This vital piece of legislation that brought the concept of the Empire forward toward the eventual creation of a Commonwealth is not as widely recognized as it ought to be. Nor is it taught at schools but then how much history is taught at schools? What a good thing would it have been if the Act had included India, admittedly a more complicated problem. Instead, there was the Government of India Act of 1935, the longest piece of legislation enacted by that time. Opposed by many Conservatives, including Winston Churchill, it did attempt to create a new political entity in India and was partially put into effect before the outbreak of the Second World War. Would it have prevented the creation of the Indian National Army that turned to the Japanese for help to secure Indian independence? Would it have ensured a more peaceful development than the terrible story of the Partition and the subsequent bloodbath? The Japanese attacked Pearl Harbour, thus finally bringing the United States into World War II. That and Hitler's monumental folly in declaring war on that country. However, the link I have, via The Raw Story, is to a fascinating story of one eyewitness account, which was considered to be too harrowing at the time (yes, well, war is harrowing) being published. Here is that harrowing tale. Gosh, this makes me really important. Not just an article in History Today but a podcast, as well. 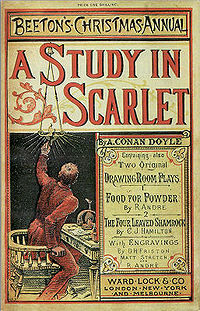 Tory Historian has no doubt whatsoever that Sherlock Holmes would have hated his birthday mentioned and really we are merely recalling the 125th anniversary of his first appearance in A Study in Scarlet, published in Beeton's Christmas Annual of 1887.